The 1896 United States presidential election in Wisconsin was held on November 3, 1896. Wisconsin voters chose twelve electors to the Electoral College, who voted for president and vice president. Republican Party candidate William McKinley won the state with 60% of the popular vote, winning Wisconsin's twelve electoral votes. 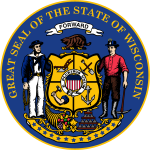 ^ "1896 Presidential General Election Results - Wisconsin". Retrieved August 18, 2016. This page was last edited on 14 December 2018, at 17:05 (UTC).